CHURCHILL Mk.IV NA 75. 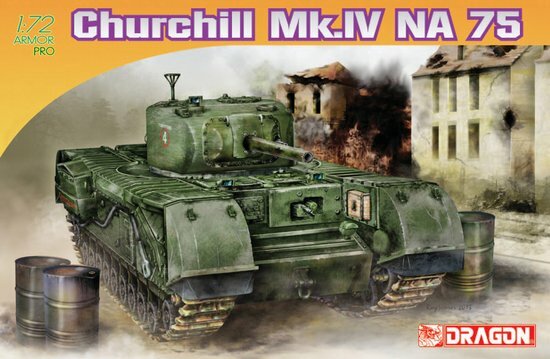 Features: - Authentic Churchill Mk.IV rendered w/full detail - Well-defined hatches can be assembled open/closed - Bolts and rivets delicately represented on hull bottom - One piece slide-molded lower hull - Slide-molded turret for Churchill Mk.IV - 75mm gun barrel can be adjusted at two different angles - Intricate tools molded modeled on vehicle - Sharply detailed one-piece fenders and hull-top - Inlet louvers molded w/detailed pattern - Idler and sprockets wheels are authentic-looking and easy assembly - One-piece bogies produced for easy assembly - One-piece DS tracks The Churchill infantry tank is a distinctive design with its extremely long chassis and wraparound tracks. Named after the British Minister of Defence, the Churchill tank was very well armored. The Mk.IV was the most numerous variant. As a field expedient, the Mk.IV was improved with an armament better than the original 6 pdr gun, and this was done by fitting the mantlet and 75mm gun (from Sherman tanks that could not be repaired) onto the Churchill’s cast turret. The first NA 75 conversions were done in North Africa, where many Shermans had been disabled by mines. (Incidentally, the name ‘NA 75’ refers to ‘North Africa’ and the caliber of the gun.) The field conversion required cutting away the front of the original turret to fit the new mantlet. Approximately 200 NA 75 tanks were converted from March-June 1944, and they saw action in North Africa and Italy.